I know how it feels, and that’s why I am writing to you now. After talking to many others who have walked (or are now walking) the road of the reorged, I know my experience of finding my way through the fog is common. With that in mind, allow me to share a few words of encouragement and warning to remember. The fight with the fear of losing your paycheck begins within the first 24 hours of being told “your position has been eliminated.” As soon as the numbing effect of shock subsides, the limbic system within our brains kicks into high gear, pumping our system with all the worry-facilitating cortisol our body can produce. The primitive part of ourselves that is primed to detect mortal danger and drive us to avoid hunger and privation at all costs is powerful … and most likely wrong. Contrary to what your fears are saying, your situation is not likely dire. Though it feels like it, you have not been cast out of the safe protection of the corporate tribe and out into the cold desolation to die unemployed. As you now are painfully aware, that warm feeling of predictable safety known as “job security” was only an illusion. You weren’t safe before, and those still employed in the cubicles and offices around you aren’t any more safe now. In matters like this, we tend to think pessimistically, as in “with my luck, this is going to be awful.” In reality, there hasn’t been a better time for this to happen to you. According to the most recent numbers from the US Bureau of Labor Statistics, the national unemployment rate is at 3.8%. Not only is that the lowest unemployment rate in nearly 20 years, but it is also only the second time we have reached that low figure since the Beatles were still a group thing. Why does the unemployment rate matter to you? Simple: you have become a free agent right when the labor market is at a historic peak seller’s market. But, as with any opportunity worth taking, you will only be able to seize it if you punch fear in its lying face. Ignore fear’s screams to grab ahold of the first piece of employment drift wood that comes floating your way. Calmly assess how much time your financial situation will allow you to tread water, and then do that. Reorient your thinking from “I’ve got to avoid drowning!” to “Where do I want to sail to next and where are the ships that will take me there?” Then start purposefully swimming in that direction. [B]ecause my career had taken over my life, I was too afraid to make any changes … Had I kept my job, I’m confident I would’ve worked in TV news until I got a cake, a watch and an on-air retirement good-bye. I would’ve missed out on finding out what I’m really supposed to do. I wouldn’t have the privilege of offering jobs to others. Take it from people who have been where you are: with your luck, this could end up better than you could possibly guess. I know this sounds odd, but let me explain. I don’t mean to allow hurt feelings and wounded pride to curdle into an anger aimed at the people who did this to you. Not only does that do nothing productive; holding onto anger is bad for your health. And like a divorce, the result isn’t just an end to a single relationship. Just like a change in marital status, the change in employment status has effects that ripple across an entire web of other relationships. Regardless of the reason, saying goodbye to colleagues you like and enjoyed working with is always a painful experience. There’s no way of getting around it: when your place at a company is gone, so too is your connection to a lot of the people you worked with. Don’t ignore these feelings of grief. Process them. Feel them. Deal with them. Only then will you find the stable emotional footing necessary to present your best self to the next employer lucky enough to now have the opportunity to hire you. Once you’ve stiff-armed fear and untangled your emotions, you will be ready to start working towards your next move. If it has been awhile since you last were in the market for a job, know this: times have changed. 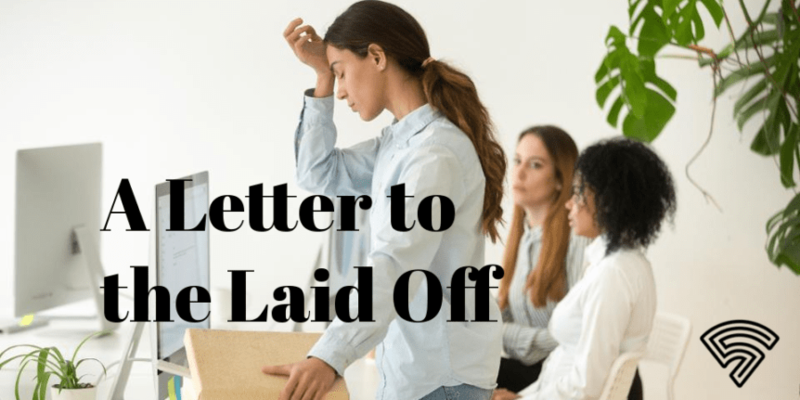 The key to seizing this layoff opportunity doesn’t lie with polishing your resume and attending a networking mixer. These stale tactics will just leave you as one more applicant in a sea of them, increasingly to be sorted by resume-scanning software long before a human being gets to assess your value. That’s where being generous comes in. Generosity is rare, unexpected, and appreciated. By using your new free time to donate your best work to others, you build a proven track record of great work while also enriching others in your network. Giving of yourself like this rarely goes unrewarded. In combining excellence and generosity, you will have built for yourself a professional asset of great value and infinitely more attractive than a resume optimized for the latest HR algorithm. Who knows? You might even find that in doing so, you uncover an idea for starting a business of your own.